Front row from left: Calvin Mondragon (Fossil), Patrick Boddicker (Windsor), Andrew Eckhardt (Windsor), Cody Wellman (Windsor), Nick Grindy (Loveland), Christian Johnson (Windsor). Second row: Jacob Aas (Windsor), Joe Dennis (Thompson Valley), Andrew Woodward (Loveland), Luke Bender (Berthoud), Axel Ayala (Berthoud), Jano Beltran (Berthoud). Standing: Ty Miller (Thompson Valley), Christian Buendia (Thompson Valley). Coaches (not pictured): Nathan Mondragon and Brett Boddicker. The Club United Black soccer team from Thompson Soccer Association finished their season by winning the Rushmore Cup. 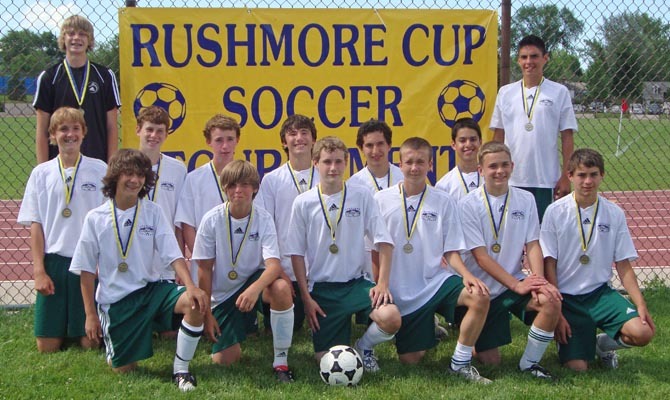 The under 15-years of age team has players from Berthoud, Loveland, Windsor and Fort Collins, The team finished the Spring 2010 Season with a record of 5-3-1 earning fourth place in a field of 10 teams in its Colorado division. The boys traveled to Rapid City, South Dakota in late June to compete in the Rushmore Tournament where they took the top spot. The team played in two tournaments this summer and did not lose a game. The overall summer tournament record was 5 wins, 3 ties, 0 losses, and one championship. The Championship game was against a club team from Scottsbluff, Nebraska consisting of players from western Nebraska and eastern Wyoming. Our boys started out the game very strong, working hard to win and keep possession of the ball from the beginning. They were rewarded with a very quick goal scored off a throw in near mid-field by Patrick Boddicker (Windsor) to Axel Ayala (Berthoud) who moved to open space and placed a through ball down the center of the field to Jano Beltran (Berthoud). Jano dribbled by one defender and skillfully placed the ball by the goalkeeper to put us ahead 1-0 at 3.5 minutes into the game. Nebraska recovered and starting gaining some momentum and put pressure on our defense forcing our central defenders Joe Dennis (Thompson Valley) and Cody Wellman (Windsor) to run down the Nebraska strikers on artful through balls. About 20 minutes into the game Jano and Christian Buendia (Thompson Valley) worked the ball out of our mid-field into the penalty box when a Nebraska defender knocked the ball away which landed near Andrew Woodward (Loveland) who controlled the ball and placed a nice shot into the back of the Scottsbluff goal for a commanding 2-0 lead. Not long after, Nebraska pressed again and received a free kick from about 30 yards out near the sideline. The Nebraska player crossed the penalty kick across our goal toward the back post and one of their mid-field players timed his run perfectly behind our defender and knocked the ball into our goal with a beautiful header. The momentum had swung to the Nebraska team and the play went from goal-to-goal with exciting opportunities for both teams. However, Club United answered the Nebraska goal with a through ball from Jano down the left side of the field to Andrew Woodward. Andrew saw the keeper coming out to challenge him and he skillfully dribbled to the near post and slotted a shot on the near post to give us a commanding 3-1 lead at halftime. The temperature was about 90 degrees and the boys were getting very fatigued, playing their second game of the day. We only had three substitutes the entire tournament. The Nebraska team did not have an earlier game that day and had five substitutes to rotate through the lineup. They definitely had the fresher legs. At halftime, we discussed the need to keep pressuring them into early turnovers, which would lessen the number of times we had to cover back on defense (thus limit our long sprints). We discussed a strategy of how we would alter our lineup if the score remained the same or if we went up by another goal. With 25 minutes to play, the score had not changed and we were giving up too many scoring chances to the Scottsbluff team. They had two great scoring opportunities; one a high shot toward the back post which our goalie Ty Miller (Thompson Valley) artfully dove backward to tip the ball over the crossbar as he fell into the back of the net. On another break down the right side their striker had a 1-1 chance to score and Ty made a great diving saving stretching across the face of the goal to snag the ball before it rolled inside the back post. At this point we rotated our lineup putting some of our mid-field runners back on the defensive line and moved some defenders into mid-field. Defenders Jacob Aas (Windsor), Andrew Eckhardt (Windsor) and Calvin Mondragon (Fossil Ridge) all worked into mid-field and began controlling the middle third of the field essentially taking the possession of the ball back into our favor. This worked very well as we did not give up another scoring opportunity to Nebraska in the last 15 minutes of the game. We then rotated players into our sole striker position up top and with great effort Christian Buendia, Nick Grindy (Loveland), and Christian Johnson (Windsor) created scoring chances on their own and kept the Nebraska defense on their heels for the final 10 minutes. We also got a solid performance in the mid-field from Luke Bender (Berthoud Goalie) as he created plenty of scoring chances for our strikers while covering on defense as needed. In the entire tournament, our two goalies only allowed the single goal scored on a great set play by Scottsbluff. Ty Miller (Thompson Valley) and Luke Bender (Berthoud) shared goalie responsibility each playing two games in the net and giving excellent efforts on the field as a substitute. Luke Bender even scored our first goal in our third game against a Rapid City, South Dakota team. Another notable effort was Christian Buendia’s five goals in our first game against a Pierre South Dakota team in a 6-0 route and an excellent way to start our tournament play. We had seven different players score our 15 goals in the South Dakota tournament with every other player setting up or assisting these goals. To win a tournament takes a full team effort, and each of these boys worked hard in every game to accomplish the goal the team set for themselves two weeks before we left Colorado – to win the championship and have fun”. Congratulations to Coaches Mondragon and Boddicker and the team.